Peaches are one of my favorite fruits, but I’m careful when buying them, as they’re fickle. As disappointing experience has taught me, when you buy them in the winter, or even early spring, they’re a ghost of what they can be; lackluster in both flavor and color. But come summer, and all their beautiful potential is realized, as they turn sweet and fiery and live up to their name as summer’s gloriously juicy bounty. Here, in a slightly trendy take on the classic dessert of peaches and cream, I grilled peaches to make them even juicier and to give them a wonderful, caramel flavor. I paired them with a poundcake fresh from the oven and freshly whipped cream brushed with vanilla bean seeds, and it was a delicious dessert, impressive yet easy to pull together. Preheat the oven to 350. Butter a loaf or bundt pan and dust lightly with flour. In a mixer, combine sour cream, olive oil, and sugar. Add the eggs one at a time. Sift the flour, baking soda, baking powder and salt directly over the wet ingredients, and mix with a spatula until just combined. Pour the batter into the prepared pan, and bake for 30 minutes, or until the top and sides of the cake are golden. Let the cake cool in the pan for 10 minutes, then turn out onto a wire rack to cool completely. Whip cream. Cut peaches off the pit, and lightly brush them with vanilla bean paste. Then sprinkle with brown sugar. Grill peaches, cut side down, for around 3-4 minutes, or until juicy and caramelized. 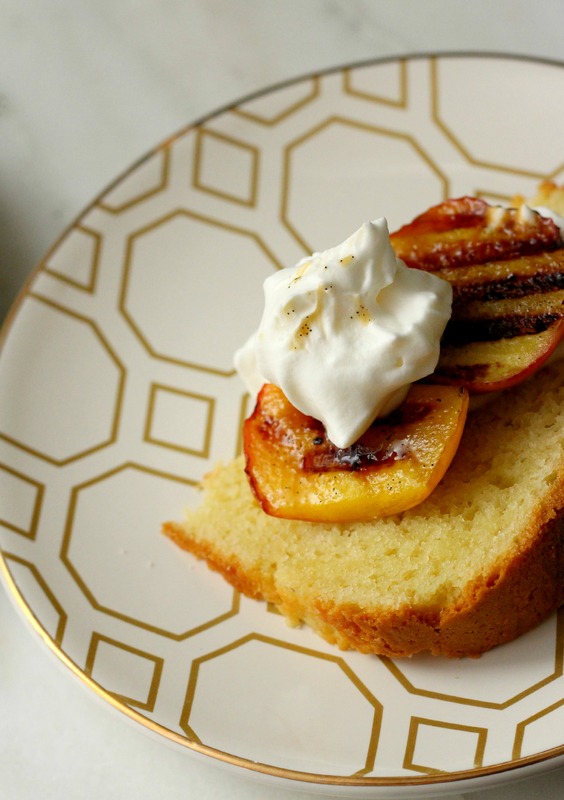 Slice cake and serve with peaches and whipped cream. 11 Aug	This entry was published on August 11, 2014 at 10:37 am. It’s filed under Delectables and tagged august, cake, cream, delicious, dessert, food, fruit, peaches, photography, recipes, seasonal, summer. Bookmark the permalink. Follow any comments here with the RSS feed for this post. What a lovely cake…I must say that I also love those plates with the gold print. What brand are they? thanks! I don’t know the exact brand of the plates, but I got them in Target a while back. Hope this helps! These look so delicious! I totally need a grill. Actually…i have like a George Foreman type deal that this might work with. Hmmm.. Thanks for the great recipe! It totally would! Our grill was actually dirty so I just used a panini-maker and it worked fine. Thanks for your sweet comment!